If we’ll go a little back, somewhere into the 50s and 60s, Ferrari was dominating the Racing industry. It was the same time that Ford showed its interest to buy the company, but at last moment deal was pulled off. This event turned to be the reason behind birth of four-time Le Mans winner Ford GT 40. Now after almost forty years, company is taking curtains of the super powerful Ford GT 2017. 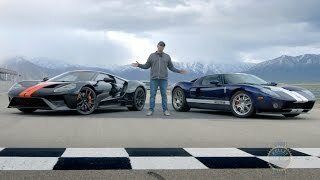 Let us have a look at the review of Ford GT 2017 to know more about it. The interior of Ford GT 2017 is designed to avail utmost control to the driver. Model comes with its seats integrated in its shell and thus the driver can have a better and closer touch to the car’s performance and behavior while at high speed on track. Though company is presenting you a fixed seat but to make drive comfortable and provide you better control, adjustable steering wheel and pedals are mounted. Behind the F1 inspired flat bottom steering wheel you’ll have a large LCD display creating the gauge cluster. The display can be totally configured and provides you entire command over the different kind of driving modes and various information, all based on your preference. In all rounding up the interior of Ford GT 2017 we would say, its driver friendly in terms of control and comfort. The exterior of Ford GT 2017 is undoubtedly recognizable upon the very first look. Made from carbon fiber, this new model’s body is designed to deliver best in terms of performance. Each and every curve carries an engineering story with it. At front you’ll notice the same sloppy nose, front of which portrays dual ducts and add to the aggressive look of model. However at the rear side you might not notice similarities with the previous models but the crisps and crunches given through round hips, those across the body and tail lights add commendably to the overall looks of model. 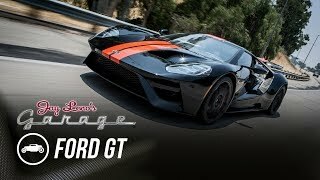 In all the exterior of Ford GT 2017 is elegant and sportive, we are sure that the model will splatter tons of class and aggression being on road. Speculations were that beneath the hood of Ford GT 2017 will be a V8 but company surprised everyone by bringing a new 3.5 Liter EcoBoost V6. Though there isn’t any word in context to power output and performance but they have shared that the set up will crank more than 600 hp of total output. Let us wait for a while till they unveil the magic power figures which will be rolling the Ford GT 2017 over its massive 20” alloy wheels.